Before we get into it, I just want to give some important definitions so we’re all on the same page. If you’re unsure about a word or phrase that’s not explained here, www.Investopedia.com has the best collection of easy-to-understand definitions for pretty much any financial jargon you can think of. They even have great videos explaining basic concepts. If I invest $1000, and by next year it’s worth $1500, that means I have a $500 capital gain, or a 50% return on investment ( ROI). The government considers this gain as income so they will tax you on it, just so you know. Interest (given in %) represents the expense for the use of borrowed money. An interest rate is this expense over a certain amount of time (usually 1 year). For example, when you have money in your savings account, they give you an 'interest rate' with that account. Say you have $100 in your savings with a 2% interest rate, that represents $2 earned in one year. As a side note, I always wondered: how do banks make money if they’re paying you? Well your money isn’t just sitting in a pile in a giant vault in the back of the bank... they’re constantly loaning out and investing your money in other places to make money for themselves. Most people will take on debt at some point in their lives; whether it be a student loan or a house mortgage. But there is also the bad form of debt that arises from credit cards and high interest loans. According to Statistics Canada, Canadians on average hold about $1.50 in debt for every $1 in their pocket. Most of this debt exists as consumer debt, which is mainly on credit cards. For those who have accumulated this form of debt, paying it off may not be an easy step- it requires significantly adjusting your spending and budgeting habits. If you can do away with your credit card debt, that’s an instant gain of 15 to 25% as you’re not paying those high interest payments any more! That’s better than the typical 8 to 10% gains with stocks. This is why getting rid of your credit card debt is the absolute first step before starting any kind of investing. Once you have gotten out of debt, it’s important to work at staying out. We have to remember the very simple idea: “Spend less than you earn.” Your income pays for both your wants and needs (food, water, shelter). In most cases our income should cover our needs fairly easily- it’s the wants that are bumping up our spending and debt. Practice sacrificing a bit of luxury today to enjoy freedom tomorrow. TIP - Focus on saving money on the big ticket items. Kijiji and Craigslist can save you hundreds of dollars on furniture, cars and appliances- most of which are in perfectly good condition. Lots of people focus on saving $0.35 on canned corn at Safeway but go out and buy a brand new TV for $1200 when the same one on Kijiji is $500. Also, be wary not to focus too heavily on collecting rewards points like Aeroplan and Best Buy. This goes especially for us Canadians who are some of the biggest points collectors in the world. Companies aren’t giving out points for just your benefit- they know it will bring you to their store and cause you to spend more money in order to rack up your points. Be careful! When people hear the above concept I'll hear quite often: ‘I don’t want to stick all my money in some bank account until I’m 65 when I won’t be able do fun adventurous things any more!’ I completely agree, life is short and tomorrow isn’t a guarantee so make every day fun, don’t wait until you’re retired to enjoy life. BUT if you budget and start today, you can both put money away for a comfortable retirement as well as have a good time today. It’s all about budgeting and balancing what’s truly important. Simplicity in life is the key. Another common way people are living these days is purely paycheck to paycheck (spending exactly what they earn). This can function in the short term but can be very precarious and risky if you lose your job or an unforeseen cost arises. It’s recommended to have a safety buffer or ‘nest egg’ of savings ready to go if you need to suddenly pay for surgery, an insurance claim or fund that ‘spontaneous’ wedding in Vegas (oops). Many Canadians are now taking advantage of Tax Free Savings Accounts (TFSA) to hold their emergency / rainy-day fund. 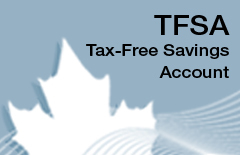 What is a registered Tax-Free Savings Account (TFSA)? The TFSA was introduced in 2009 and allows Canadians aged 18 and older to save up to $5000 every year completely tax-free. (update: $5500 as of 2013) For instance with $5000 in a TFSA with a 2% interest rate, you would not pay taxes on the ($5000*0.02)= $100 interest you would make in the year. TFSA’s can act as more than just a simple cash savings account. You can carry stocks, bonds, GIC’s and so on. If you put more than your $5000 in, you will pay 1% interest on that over-contribution every month. I’d recommend having a journal or Excel file with your TFSA contributions and withdrawals so you don’t accidentally over-contribute. If you can afford to put some money away for a while, I'd recommend to put your stocks and bonds in your TFSA before using it as a savings account. The tax savings on an 8% stock return is a lot more significant than on the 1.5% interest rate return in your savings account. Lastly, one thing I was confused about, "what happens if I invest $1 of a 'magic' stock in my TFSA and it goes up to $1 Million, then I sell it?" Well, now your contribution room in your TFSA is $1 Million, and that $1 Million earnings is tax-free! So you can effectively 'boost' your contribution room with investments. A credit card can be a useful tool or a dangerous piece of plastic that can ultimately lead to high debt and even bankruptcy, depending how you decide to use it. I realize most people have a credit card, but I want to discuss them in depth here because the concept of credit and credit cards play an extremely important role in financial responsibility. I imagine very few high schools are teaching kids how to properly use credit (something that I hope changes one day) so the more knowledge about credit cards the better. Credit cards play a major role in society these days- in 1999, American consumers charged about $1.2 trillion on their general-purpose credit cards. (source: Canadian Living) They have even become an important source of identification- if you want to rent a car for example you usually require a major credit card. Used wisely it can allow for convenient purchasing that allows the buyer up to nearly a month to pay for their purchases before interest kicks in. But unfortunately many find it too easy to swipe their piece of plastic in impulse buys or on things they really can't afford. It’s dangerous since you don’t actually watch the cash leaving your pocket during the transaction. When you use a credit card all you are doing is borrowing money from the card's institution. As with all loans, you have to pay interest, which is just the cost to borrow the money. And the longer you take to pay them back, the more you pay. You’re allowed an interest-free ‘grace period’ that lasts for around 1 month after your purchase. If you always pay off your loan in the grace period you will never have to pay the credit card company a penny! Typical interest rates nowadays range from around 15 to 25%. With a maxed out credit card of $5000, at 18% interest rate, you are losing $900 in interest every year! And keep in mind that they are charging interest on top of that interest so it would in fact be more than $900. Ouch. And though this makes the cardholder unhappy, it is a joyful day for the card companies! The minimum payment is the absolute least amount you can pay on your credit card debt without incurring a late fee. Basically, by paying the minimum amount you are just paying off the interest you owe and a small fraction of the principal. Paying only the minimum is not a wise choice (despite what the credit card companies think), as you will be paying off your card for a painfully long time and will end up spending much more than the initial cost of your purchases. When you don’t even make the minimum payment, you will incur a late fee and your credit score can even be negatively affected. A cash advance is when you use your credit card as a debit card and withdraw money from an ATM. This is not recommended, as interest will immediately kick in as soon as you withdraw the cash. There is no grace period for cash advances, so only use this option as a last resort! There will come a day when you’re going to show up at the bank and proudly say that you want to buy a house, and one of the first things they look at will be your credit score. It’s pretty much a report card of how well you handle credit. If you hold 5 maxed-out cards, it’s going to make getting a good mortgage a tough time. So not only does over-using credit hurt your bank account, it also affects you down the road. Credit cards are not replacements for cash and they're not evil. They're inert objects but they do offer a great deal of temptation. It's how we handle that temptation that leads us to the depths of consumer debt or the heights of financial responsibility. Don’t you find it strange that in high school they taught us what the Binomial Theorem is and what all the capital cities of Japan are but never taught us any basic finance tools? The concept of “don’t spend more than you earn” seems like complete common sense, yet there are millions of regular hard-working people who do the exact opposite. Maxed-out credit cards (today the average American has 3.5 credit cards), enormous mortgages and families with four people and five cars are just some of the regular occurrences in our materialistic and consumer-focused society. “Consumerism becomes excessive when it extends beyond what is needed. When we begin consuming more than is needed, boundaries are removed. Personal credit allows us to make purchases beyond our income level. Advertisements subtly reshape our desires around material possessions. And the consumption culture that surrounds us begins to make excessive consumption appear natural and normal. Less pressure to impress with material possessions. Poor financial choices are essentially what started a series of events that caused the recession in 2008. Obviously it was a complex number of things, but one of the key factors was that banks and lenders offered extremely low-rate mortgages with little to no required down payment to people who realistically should not buy huge expensive houses. When the value of the houses dropped due to eventual lack of demand, banks increased everyone’s low interest rates. Well, obviously people couldn’t afford the increased payments and the houses foreclosed. Oh no! This started a downward spiral, as housing construction stopped pretty much immediately, which led to many lost jobs. And as more people lost work and homes, thinks just kept getting worse. In this situation, the banks and greedy government institutions we’re at fault for creating these insanely low-rate mortgages but it was also the citizen’s lack of financial know-how that drew them into making poor purchase decisions.